Negative Amortization - What Does It Mean? What does negative amortization mean? 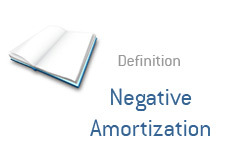 What is the definition of negative amortization? Negative amortization, also referred to as "NegAm", takes place when the outstanding balance on a mortgage increases with each passing month. If a borrower doesn't make a large enough payment to cover the interest owed every month, then the size of the principal will increase. To figure out how much the principal will increase each month, simply subtract the amount of interest owing by the payment made, and the remainder will be added on to the principal. How could this happen? How could a mortgage grow each month? Many of the mortgages that were popularized during the real estate boom in the United States featured introductory "minimum payments" that were not large enough to even cover the amount of interest owing. These "minimum payments" were designed to entice people into purchasing homes that they might not otherwise be able to afford. An example of a mortgage that featured these minimum payments were the Option ARMs. Negative amortization can only last so long in a mortgage - eventually the mortgage is "recast", and the size of the payments jump considerably.